Sándor Kalmár M.D., Ph.D. is a well-known teacher and physician in Bács-Kiskun County, Hungary. He is a psychiatrist with a background in neurology, social medicine and public health. Dr Kalmár’s main areas of interest in Psychiatry, Neurology and Social Medicine and Public Health are psychopathology, disturbances of perception, depressive disorders, suicide and its prevention, the role of teaching of GP’s in suicide prevention, alcohol induced disorders, quality assurance in Psychiatry, Internet and Psychiatry, the role of Primary Health Care in the Psychiatry, education of medical students, teaching General Practitioners, psychiatrists, nonprofessional people and civilian population. Dr. Kalmár participated in the Prototype Depression Recognition and Suicide Prevention Program in Eastern Europe: a Pilot Project in the region of Kiskunhalas, Hungary, which was supported by Prof. Dr. Herbert Hendin and Prof. Dr. J. John Mann on behalf of the management of American Foundation for Suicide Prevention (AFSP) similar to the Gotland study. During this education program run by Hungarian and American experts in psychiatry Dr. Kalmár participated in lectures and seminars. Dr. Kalmár is the editor of a book, and the author of the first Hungarian Psychiatric Dictionary, the first Hungarian Neurological Dictionary, the Hungarian version of the Complex Diagnostic Evaluation of Depressive Disorders by Thomas Ban, the Hungarian version of the Complex Diagnostic Evaluation of Hyperthymic Disorders by Peter Gaszner and Thomas Ban, Psychiatric Propedeutics, and some chapters in different books. He is the author of several medical articles. In his leisure time, Dr. Kalmár likes listening music, travelling abroad and inland. He is interested in the Greek and Hindu mythology and religion. The person is not only the body and soul. Every human being has a lot of deep, complicated, ramified biological or somatic, psychic, cultural (mythological, historical, social) and spiritual roots. This is the foundation of each medical practice. ‹ Puneet Narang, M.D. 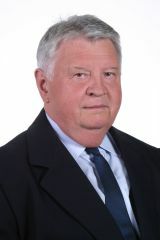 › Zoltan Rihmer, M.D., Ph.D., D.Sc.